After suffering a 0-4 drubbing by Conan Byrne of St Patrick’s Athletic at Tallaght on Friday, Shamrock Rovers needed to pick themselves up again if they wanted to reach the EA Sports Cup final for the second year running against Drogheda United, current holders of the trophy. But the Hoops got off to the worst possible start. Rovers’ manager Trevor Croly had only just taken his seat in the press box in the middle of the stand when the visitors took the lead with their first attack after just over 30 seconds. Kieran Djilali put the the visitors ahead, latching on to a clever pass from Rafaele Cretaro and striking his shot past Barry Murphy into the far corner of the net. In the tenth minute more sloppy defensive play meant Murphy had to get down smartly to push Seamus Conneely’s shot around the post for a corner. The home fans were delighted in the 17th minute when Rovers produced an equaliser through Karl Sheppard. For Sligo, former Hoops’ striker Aaron Greene had two chances to put them ahead again, shooting wide from a free and then heading past the post from close range following a cross from Cretaro. Hooperman did his best to encourage the home support and it wasn’t long before the third goal arrived, edging Rovers in front. O’Connor’s free from just outside the box deflected off the wall but Evan McMillan’s clearance only got as far as Gary McCabe, who shot past Rogers into the top corner of the net in the 27th minute. Sligo boss Ian Baraclough was forced to replace Evan McMillan with Danny Ventre just before the end of a half that saw yellow cards for Murphy, Cretaro and the Reds’ captain Gavin Peers. Gary McCabe got his second in the 71st minute giving Rovers a 3-1 advantage. But Sligo were not finished and with eight minutes left, substitute Anthony Elding who had come on for Rafaele Cretaro nodded home Greene’s deep centre. Then a Joseph Ndo strike from just inside the box was tipped over the bar by Murphy, as the visitors sought to bring the match to extra time. A late corner, for which keeper Gary Rogers travelled to the opposition box, was the last chance for Sligo but it failed to beat the first defender and it was the Setanta Cup holders Shamrock Rovers who progressed to another final. Shamrock Rovers: Barry Murphy, Conor Powell, Derek Foran, Pat Sullivan, Conor McCormack, Gary McCabe (sub Thomas Stewart 85), Shane Robinson (captain), Richie Ryan, Ronan Finn, Sean O’Connor, Karl Sheppard. Sligo Rovers: Gary Rogers, Alan Keane, Gavin Peers (captain), Evan McMillan (sub Danny Ventre 45+1), Jeff Henderson, David Cawley, Rafaele Cretaro (sub Anthony Elding 66), Joseph Ndo, Aaron Greene, Kieran Djilali, Seamus Conneely. 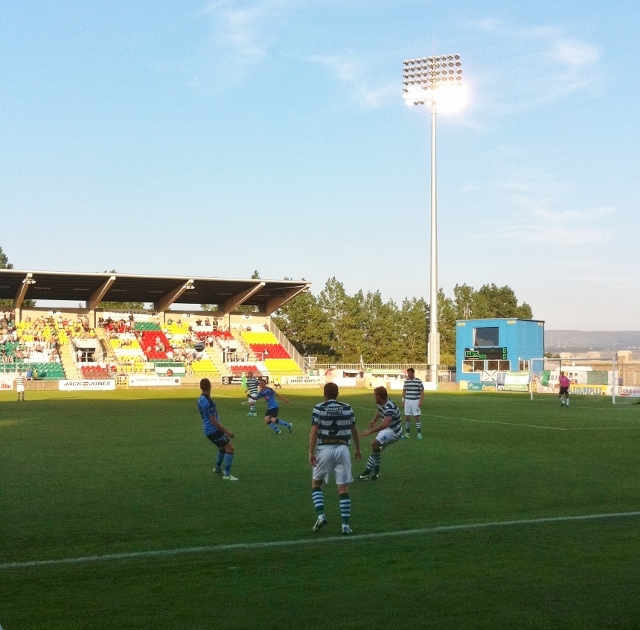 A nice summer evening at Tallaght Stadium in South Dublin, with short-sleeve shirts being the order of the day in the Mediterranean-style heat. The groundsman had obviously been working overtime watering the grass. This was an oasis of green in a city where every back garden seemed to be parched brown. The match programme explained how there was a water well situated at one side of the ground and it was in constant use, much to the consternation of Bohemian FC during a recent visit, apparently, who did not appreciate the sprinklers being on during their warm-up. There seemed to be a very good atmosphere in the main stand, with plenty of young people there with their parents or minders. Some of them took part in a mini soccer game at half time, displaying their skills for all to see. This is a great way to encourage new support, by bringing in children and making them feel welcome. It was noticeable that a number of Rovers’ supporters were non-Irish nationals whose children were possibly born in Ireland. There were also strong warnings in the programme that racist behaviour of any kind would not be tolerated by the club. Full marks to Rovers for their approach. Rovers star on the day was a 29 year-old Libyan Eamon Zayed, who was signed by the club earlier this month. 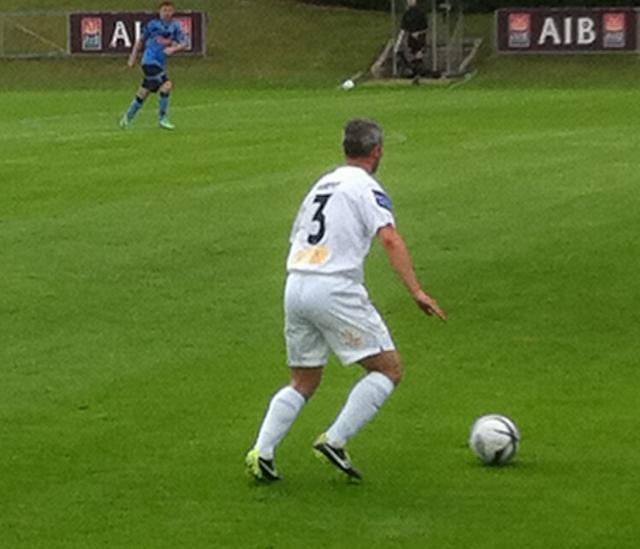 He has played for a number of League of Ireland clubs. 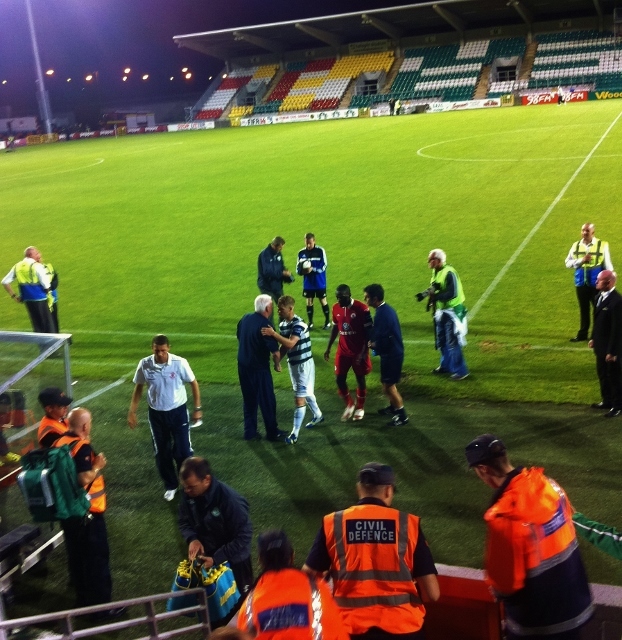 The player, capped 12 times at under 21 level for the Republic of Ireland, has in recent years gained valuable international football experience playing with Libya whilst playing his club football in Iran. In 2011 the striker signed for Tehran Pro League club Persepolis where he was part of their Asian Football Confederation Champions League squad. Zayed’s score in the 24th minute gave Rovers a good start. 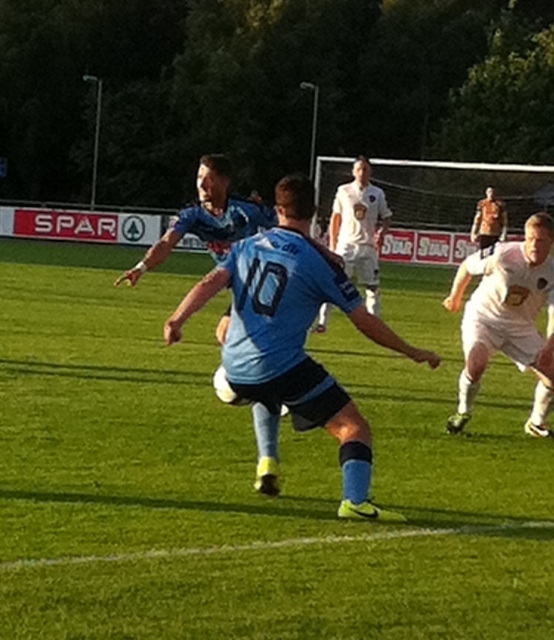 The students did not look as sharp in the first half as they had done three weeks ago against Cork City at Belfield. Their equaliser in the second half came against the run of play. In fact, I was looking down at this picture I had just taken on my iphone when College through Robbie Benson had the ball in the net in the 65th minute. 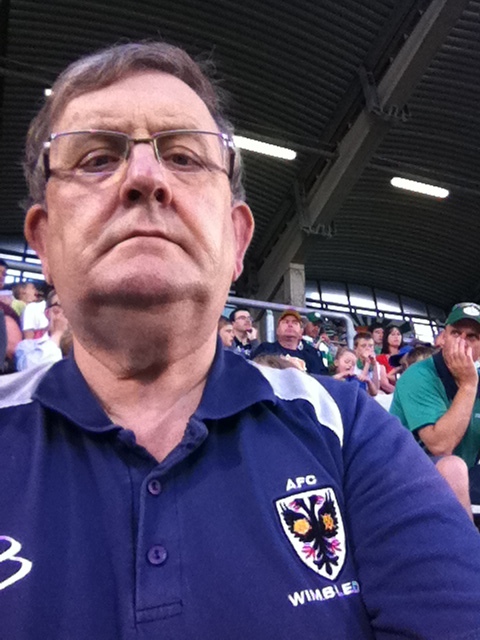 I put on my AFC Wimbledon polo shirt this morning when I left Belfast and it was coincidental that I wore it to the match, but I am always glad to support both the real Dons and Rovers. By the way, you can see a sort of worried look on the face of the Rovers supporter behind me with a green cap! So the spoils were shared and Rovers dropped two valuable points, which will not please their manager Trevor Croly. By the way the referee (and I thought he did a good job) was from Monaghan, Paul McLaughlin, who it turns out is a Garda from Inishowen, Co.Donegal. 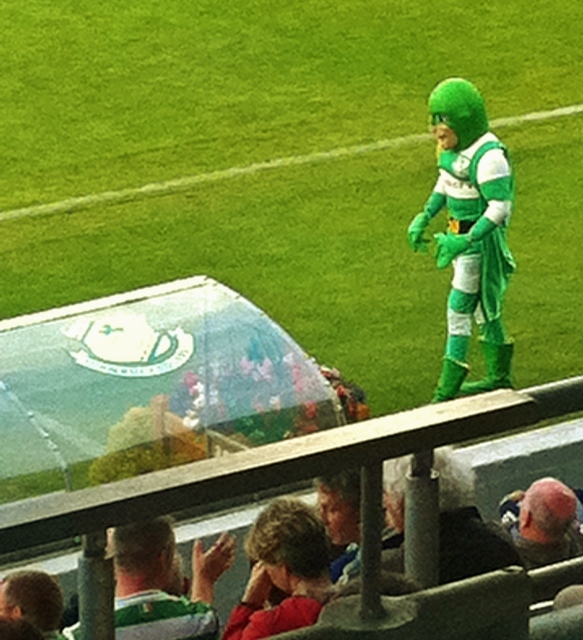 He has been on the League of Ireland referee panel since 2008. We are Wimbledon: see my blog last December to know the reasons why. 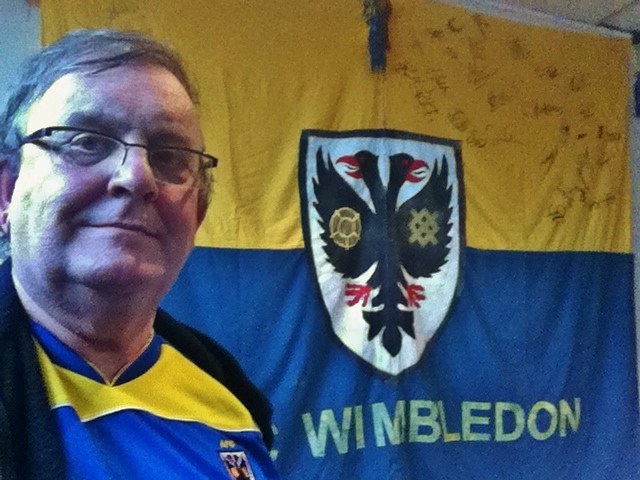 I am a founder member of the Dons Trust in 2002, a decision which led to the formation of AFC Wimbledon, a team that started off in the Combined Counties League and (re-)entered the Football league in 2011/12. 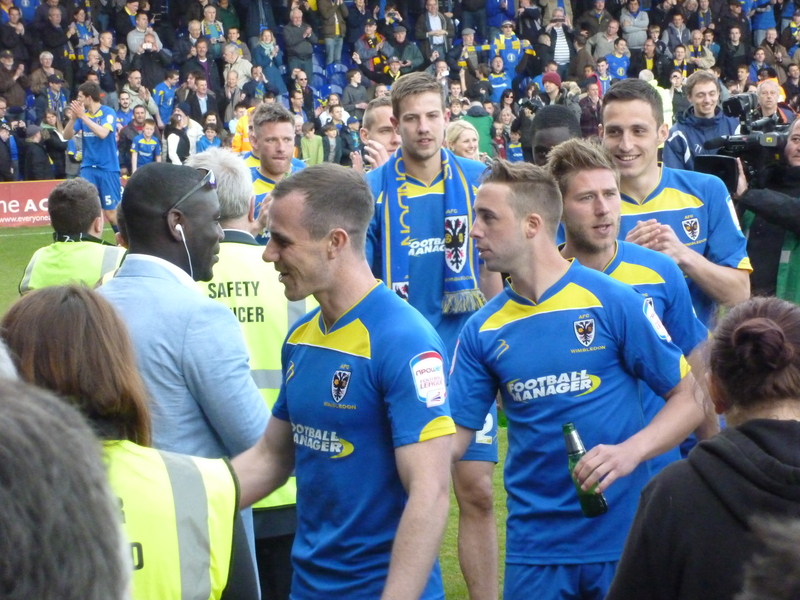 We just about survived in League Two last season: see my article AFCW: We’re Staying Up! in April. On 28th May 2002, the Football Association backed a three-man independent commission decision to allow Wimbledon F.C. to relocate 56 miles North to the new town of Milton Keynes in Buckinghamshire (otherwise known as roundabouts, like Craigavon). 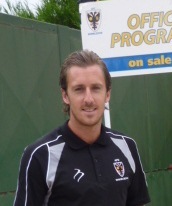 The Wimbledon chairman at the time Charles Koppel claimed such a move was necessary in order to prevent the club from folding. This franchising of a club was unprecedented in English football. By moving so far from their original base in London SW19, Wimbledon F.C. were cutting all ties with the area. Although the club was unable to move to Milton Keynes for over a year, their small band of loyal fans stayed put. On 30th May 2002 a group of supporters led by Kris Stewart and fellow founding members Marc Jones and Trevor Williams, announced plans to create a new club , AFC Wimbledon. On 13th June 2002, a new manager, kit, crest and ground (shared with Kingstonian FC in Norbiton, in the nearby Borough of Kingston-on-Thames and on the 131 bus route from Wimbledon) were unveiled to fans and the media at Wimbledon Community Centre. In order to assemble a competitive team at short notice, AFC Wimbledon held player trials on 29th June 2002 on Wimbledon Common, open to any unattached player who felt he was good enough to try out for the team. The event attracted 230 players, from whom the club’s squad for their inaugural season was chosen, under the captaincy of former Chelsea player Joe Sheerin, who ended up at Leatherhead in 2006. Forward Kevin Cooper (no relation to my friend in Belfast!) was the player of the year. 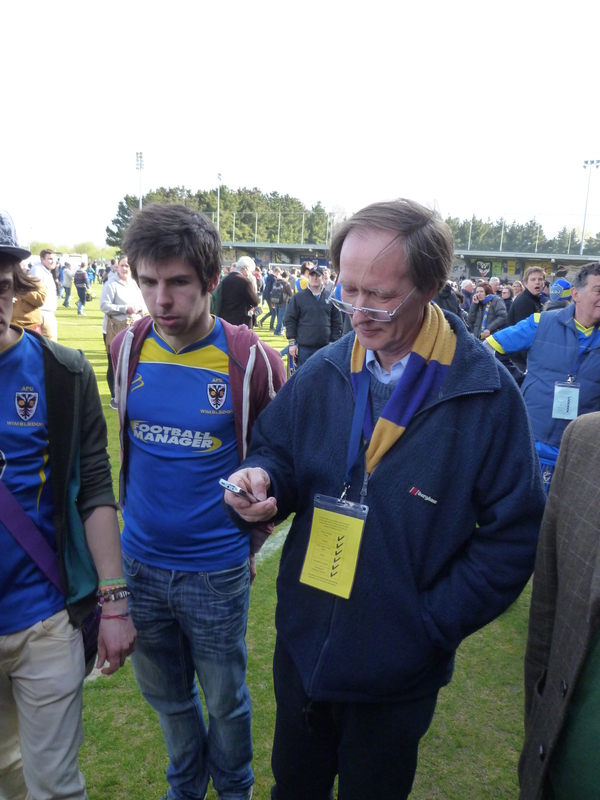 In March 2003 the Dons Trust members voted to purchase part of the lease for the ground at Kingsmeadow and in June 2003 the contract for buying the lease to the stadium was agreed with the owner Rajesh Khosla. £2.4 million needed to be raised, and a share issue in which I was an investor raised over one-third of the required amount. Further amounts were raised through a bond issue (in which I also invested) and a commercial loan was organised through Barclays Bank, not an easy task for a completely new entity which had no financial record. Then we, astonishingly, managed to get a bank loan which cleared the final tranche of the debt on purchase. We make the capital repayments on the loan from the Trust’s fundraising and the interest is paid by the operating company. *The plan for a new stadium is based on proposals for the redevelopment of the greyhound stadium at Plough Lane in Wimbledon, alongside what was once the home of Wimbledon FC and is now a housing estate. 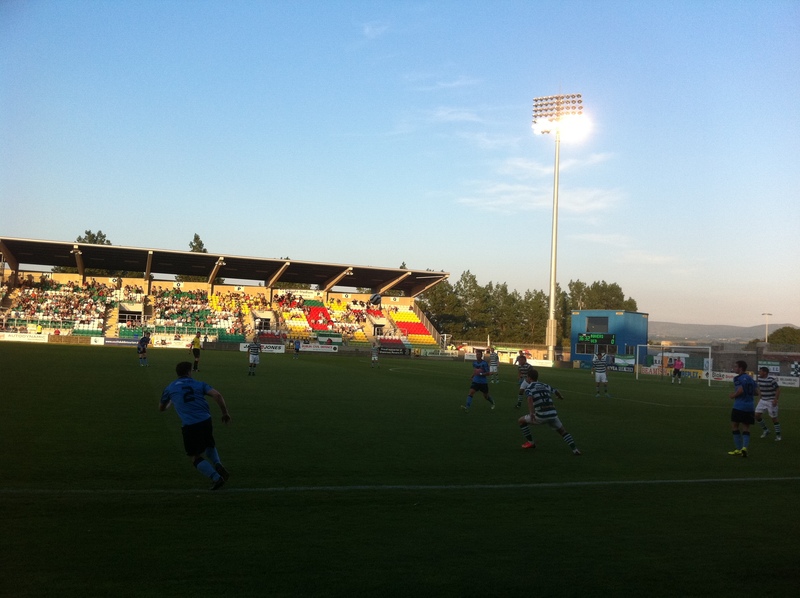 Remember what happened to Glenmalure Park and now Shamrock Rovers FC are in a brand new stadium in Tallaght, with the support of South Dublin County Council? 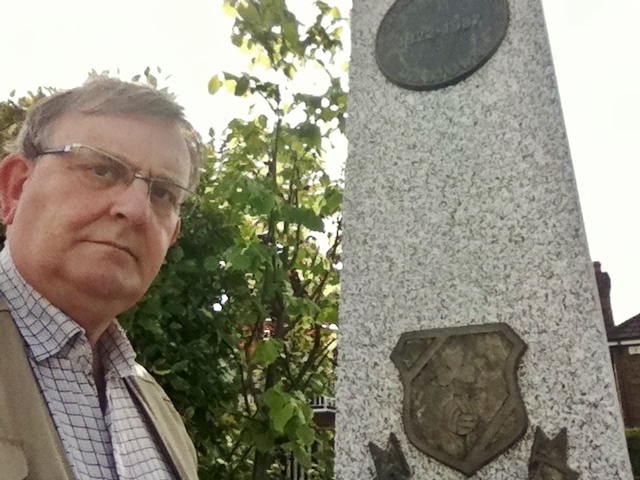 This afternoon I passed by the Glenmalure Park memorial at Milltown and memories came flooding back, just as they do whenever I am near Plough Lane. 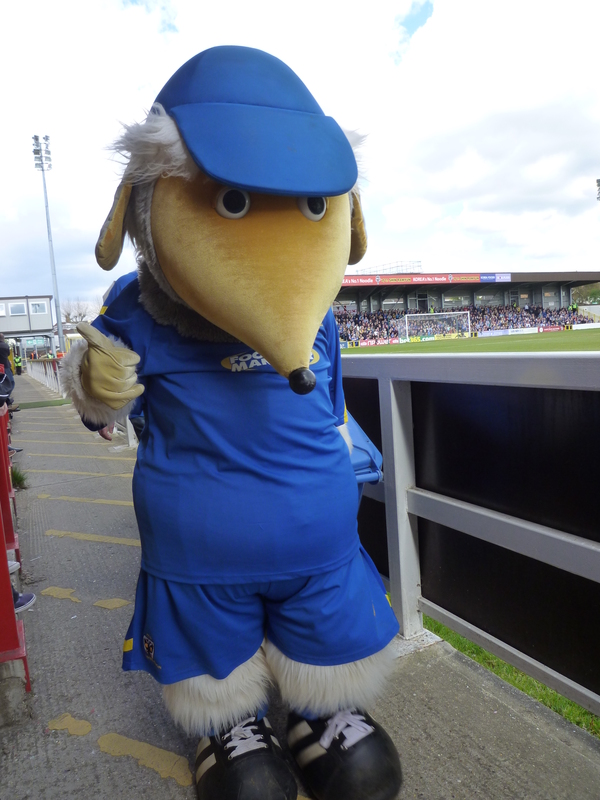 I am one of the AFC Wimbledon five year season ticket holders, in the front row of the main stand near the middle of the pitch. If I cannot make it to a home match, the Club can re-sell my seat and gain added income, as well as reclaiming the VAT on my ticket. 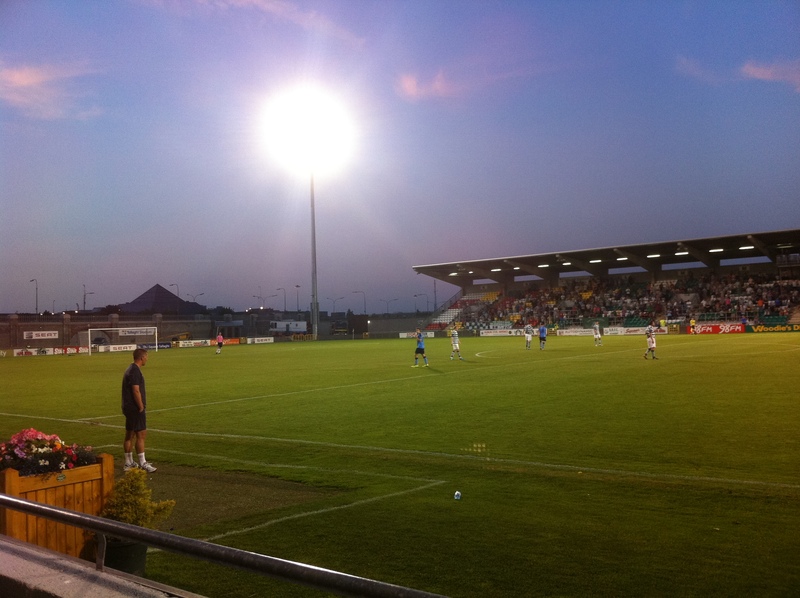 Given the level of my commitment to AFC Wimbledon, you can now see why I am opposed to the visit of Franchise FC to my other “home patch” at UCD in Belfield, where I went to University in the first year of the Arts/Commerce Block and just a short walk away from where I am typing this article in the family home. 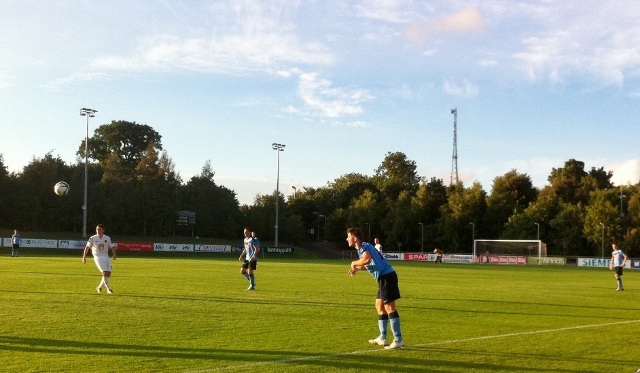 So once again I will say it: UCD AFC are entitled to play whoever they choose. But let’s not give Franchise FC the traditional Irish “Céad Mile Fáilte” when they arrive in Dublin for pre-season training. To the FAI and Airtricity League my message is this: Franchise FC were supposed to be coming to Dublin at one stage (or even Belfast) and a few prominent businessmen and commentators were doing their best to encourage a move across the Irish Sea to set up the “Dublin Dons” in the English Premiership. Wisely, in my view, the FAI said “NO” but that did not stop a certain pop music executive now property developer from setting up a soccer franchise in Milton Keynes, with the blessing of the Football Association. They took away our Club and eleven years on, we have given them the answer. I left the Belfield Bowl delighted to have seen a College victory over the Leesiders, having kept a clean sheet in the process. After the final whistle had blown, however, the PA announcer said something that made me seethe with rage. He was announcing a series of three mid-season friendly games to be hosted in the coming fortnight by the UCD Club. League One side Peterborough are first up next Wednesday, 3rd July. But then came the dreaded words “MK Dons”, known to us AFC Wimbledon fans and many other true football supporters simply by the name “Franchise FC”. The match is due to take place at Belfield on Tuesday 9th July and the third one in the series is against Aberdeen (July 16th), coincidentally nicknamed the Dons and in my view the only other Club worthy of that sobriquet apart from AFC Wimbledon. 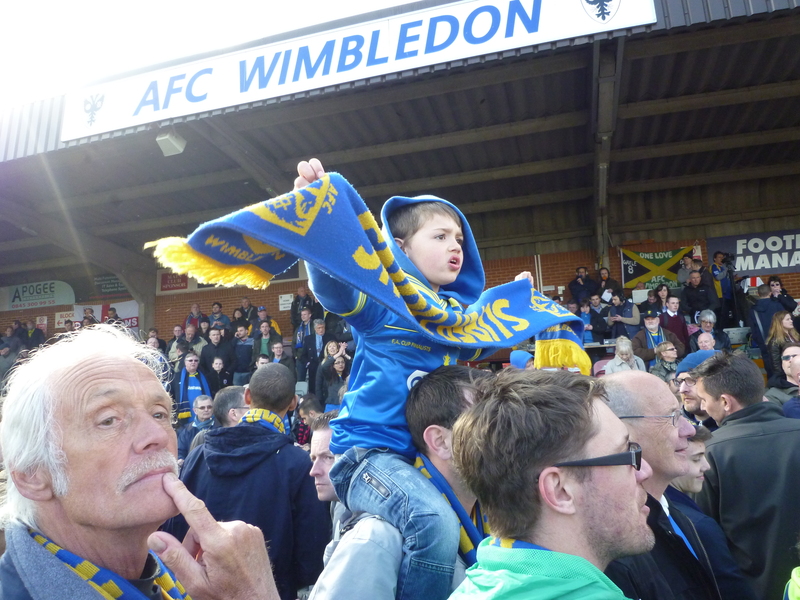 To see how strongly I feel about the issue, see my post in December “We are Wimbledon” when I went to Kingsmeadow to watch the Dons playing Franchise FC in the FA Cup, rather than go to a place sixty miles from London. 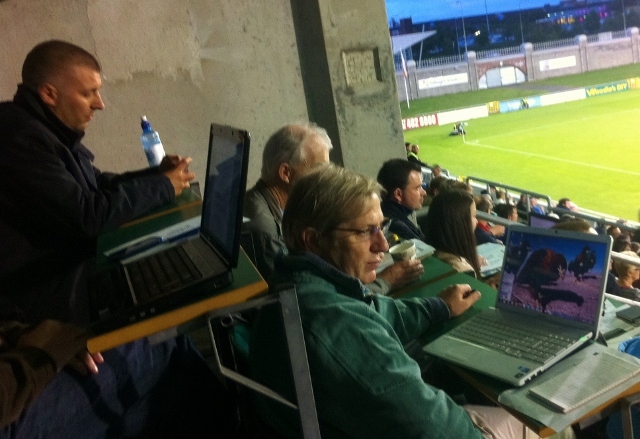 I’m sure UCD badly need the revenue from these games. 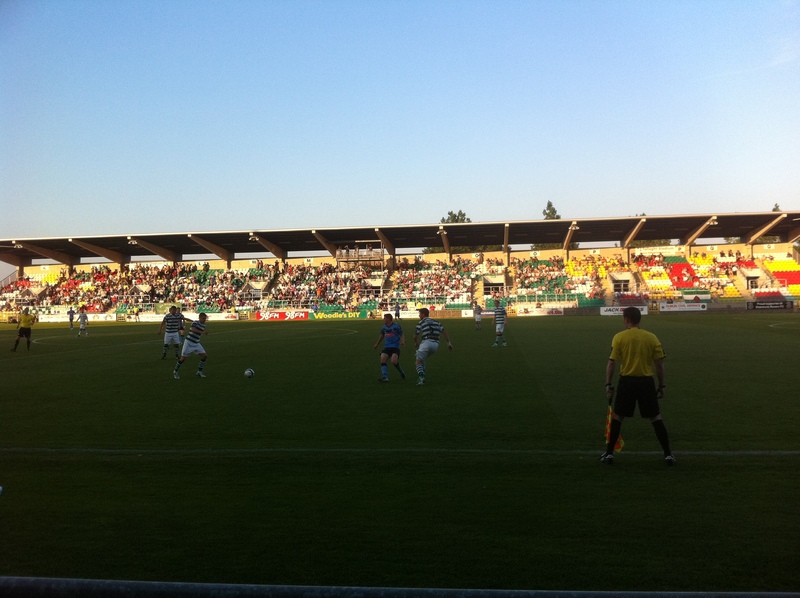 There were only a few hundred fans at tonight’s match, about fifty of them following Cork City. As the away team came off the pitch, their followers chanted slogans at them about being “rubbish” and not fit to wear the club shirt. So I do not want to advise a total boycott of the game. Every Euro that comes into the UCD Club is I’m sure put to good use. But what I will say is that should I decide to attend Belfield that night, I will be asking all true soccer supporters, including my friends from Shamrock Rovers who I met on the Milltown 25 walk, please do nothing to give this Franchise Club a welcome in our capital city. For those who do not know my background, I am a UCD Arts Graduate (1973) having arrived back in Dublin in 1967 from Wimbledon, where I began my support of the Dons in their amateur Isthmian League days when Irishman Eddie Reynolds was my hero. During my time at College I was a Shamrock Rovers supporter, (Eddie Bailham left Rovers and went to Wimbledon) having discovered their Glenmalure Park ground backed onto the sports pitches where we played rugby at Gonzaga College. One of the stars of the Zaga team of that era was Tony Ensor who played for Ireland as full back. 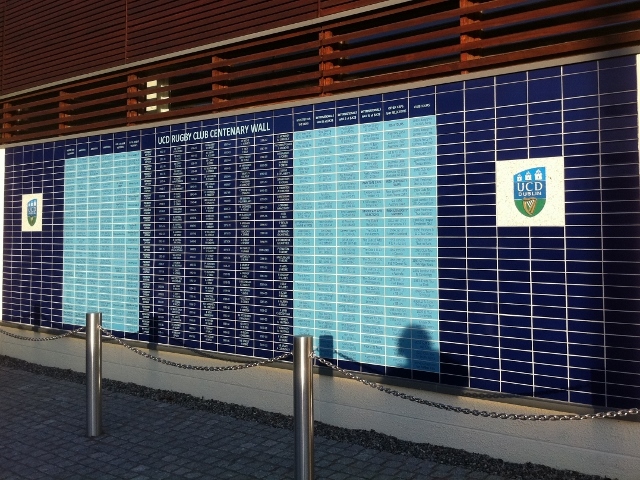 By coincidence I spotted his name at half time on the UCD Rugby Club Centenary Wall which has been added to one side of the changing rooms. I was told it had gone up only in the past month. Other Gonzaga greats on it include Peter Sutherland, Barry Bresnihan and Kevin McLaughlin. 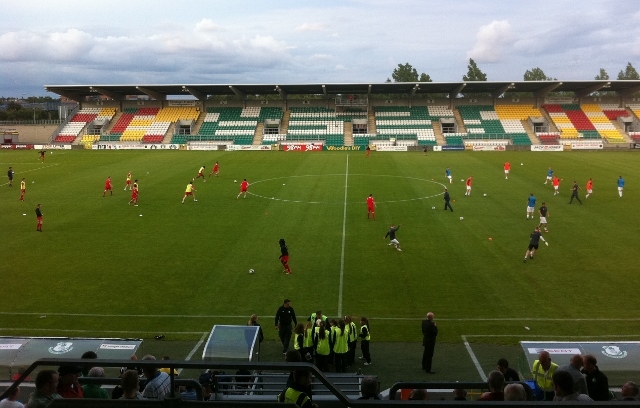 A great result for the Hoops tonight at the Showgrounds. That’s as far as I got when my mobile phone battery ran out as I travelled on the train back to Belfast, making use of the excellent wi-fi facilities the new rolling stock has. Thanks Translink! Now that I am back home by midnight, I can complete the task and add my photos. This was a much better performance by Rovers than in the first leg at Tallaght, when they went down 1-0 just before half time. The visiting fans sang their way home to Coleraine, I expect, as they were cheering their team throughout and were still in fine voice when they left Dublin. It was the other way round though at the Showgrounds in the second leg. Trailing by a single goal, Rovers were quick off the mark and showed a determination that had been lacking in the first leg. Jason McGuinness had the first chance from a free kick, but his effort went wide. Striker Mark Quigley gave them the goal they were looking for in the seventh minute, with a fine six-yard volley. 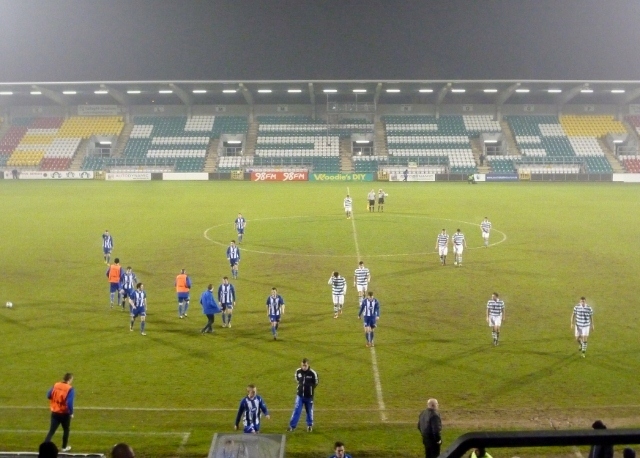 Coleraine took time to establish themselves and after 27 minutes had their first chance with a Stephen Lowry header. Shane Jennings then sent a shot just wide when a corner was flicked on by Lowry. Ruairi Harkin also came close. Eight minutes into the second half, Gary McCabe became the first of three Rovers’ players to receive a yellow card. A James Chambers shot was tipped onto the bar by the Coleraine keeper Michael Doherty and the visitors had another chance within a minute, from the resulting corner. Rovers kept up the pressure but it needed two substitutions by manager Trevor Croly before the right combination could be found. 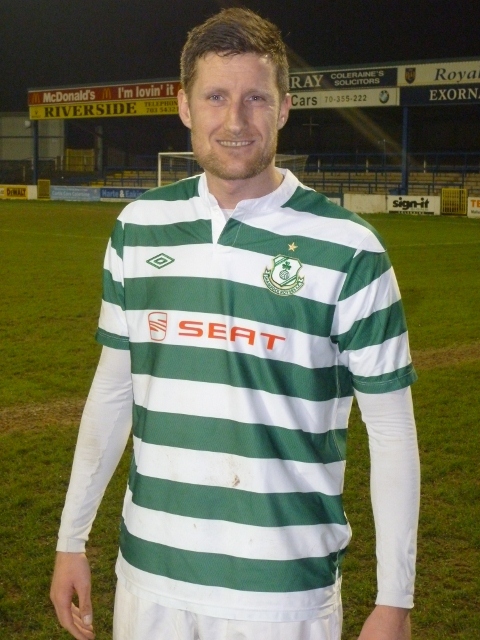 Strikers Ciarán Kilduff and Thomas Stewart were brought on in the 69th and 77th minutes respectively. With two minutes of additional time just called and just as it seemed the match was going into extra time, the decisive strike came, thanks to Kilduff whose shot found the bottom corner of the net after a scramble in the goalmouth. 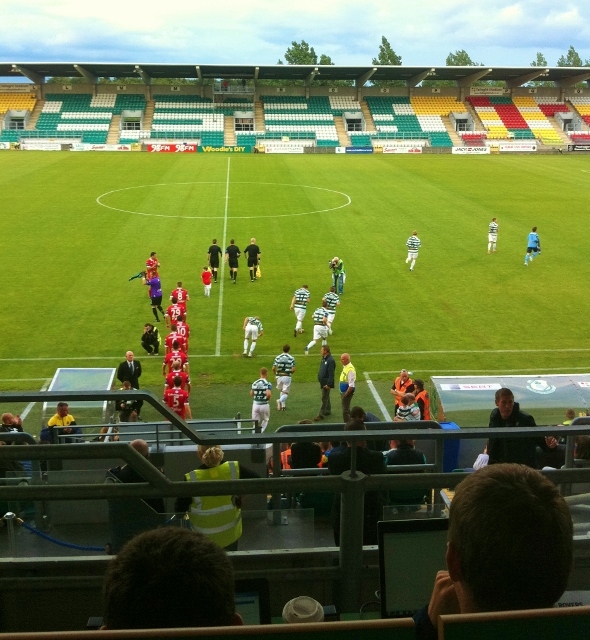 It marked the first win in a competitive match for the new Rovers’ manager, who was appointed in November last year before the start of the new Airtricity League season in March. In the second round of the Setanta Sport Cup, Shamrock Rovers have been drawn against Linfield, with the first leg at Tallaght on March 4th and the return a week later at Windsor Park, not far away from me on the Lisburn Road. I hope that any true Rovers fans who travel North will be given as hospitable a welcome as they got at the Social Club in Coleraine, where politics was put to one side and sport reigned. This was a truly sporting occasion of cross-border significance and I was also pleased to witness the friendliness of the Coleraine fans who travelled to Tallaght last week. 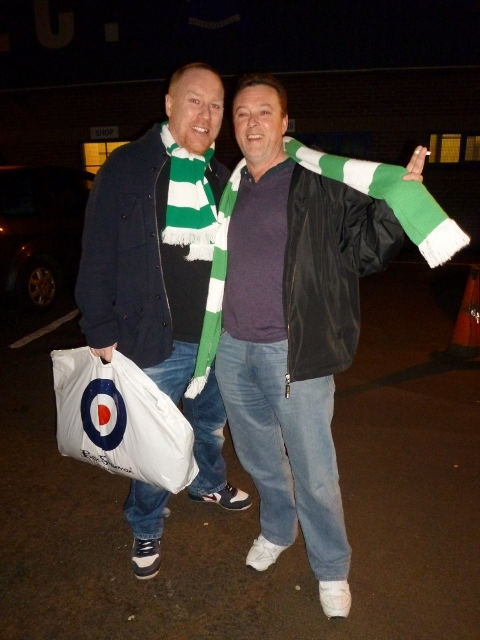 These two Rovers’ supporters arrived in a happy mood and went home to Dublin even happier! Back in the days of my youth, I remember seeing one of the matches in a cross-border competition, the Blaxnit Cup. It might have been the second leg of the final at Dalymount Park in May 1968, when Shamrock Rovers lost 2-1 to Crusaders from Belfast, but took the first trophy 3-2 on aggregate. The following season, Rovers were again in the final but lost 4-3 to Coleraine, who went on to retain the trophy the following year by defeating Sligo Rovers in 1970. The Irish League side re-appeared in the 1972 final but went down to Cork Hibernians over two legs. The competition featured four clubs from the League of Ireland and four from the Irish League and it ran until 1974, when it was replaced by the Texaco Cup and then after a break, the Tyler Cup until 1980. For that reminder about Coleraine’s previous Blaxnit success. I am grateful to David McClarty MLA, who was following my tweets from the ground on facebook. In one of my tweets I mentioned that one of Coleraine FC’s stalwart fans is the actor James Nesbitt, Chancellor of the University of Ulster, who was in Dublin on Saturday for the IFTA awards ceremony. Since 2005 the all-island club competition has been known as the Setanta Sports Cup. 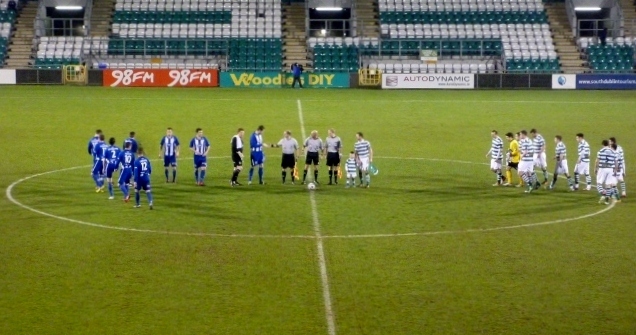 This evening at Tallaght, the Hoops and the Bannsiders renewed their rivalry in the first leg of a first round match. 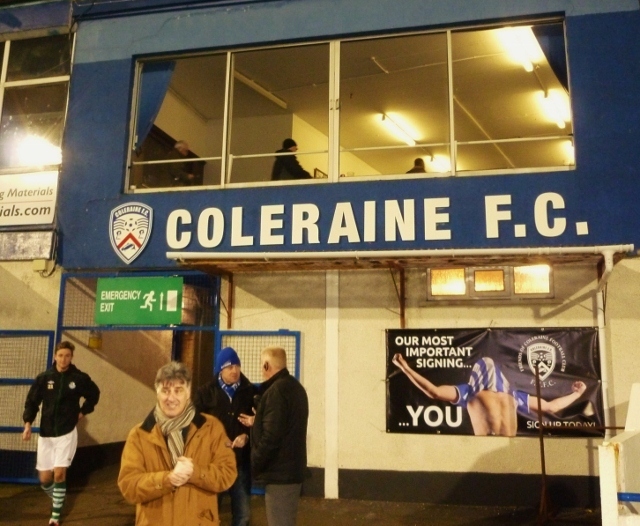 I have been following Rovers at their new stadium over the last two seasons, but I don’t think I have ever seen Coleraine in “live” action. I was impressed by the visitors and their vocal bunch of around 200 supporters who made the long trip to Dublin from the North-West. 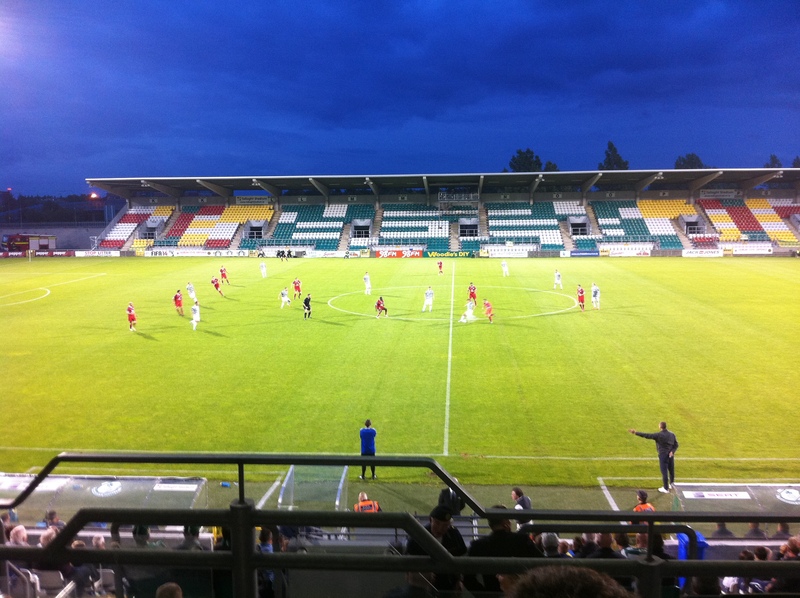 The new-look home side were playing their first competitive senior game this year, because of the difference in soccer seasons in Northern Ireland and in the Republic. Before the game, one minute’s silence was strictlly observed by the teams and the crowd in memory of Tony Clare, a Rovers supporter who passed away recently. 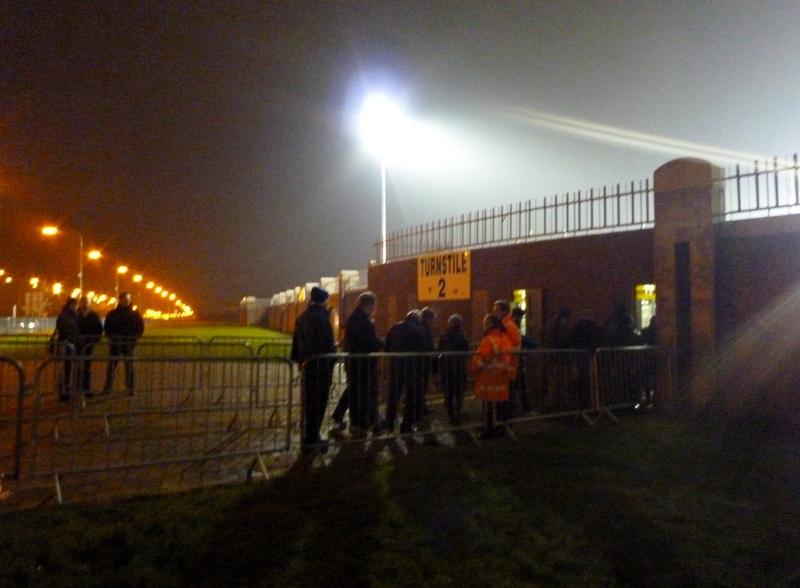 Then it was into action, but I missed the usual roar of the home fans and only one stand was in use. I also noticed that one of the banners behind the goalmouth had a picture of Rovers’ former striker Gary Twigg on it. He is now playing for Portadown in the Irish League, who lost 3-2 at Drogheda in the same competition. Shamrock Rovers had most of the goal opportunities in the first half, with Mark Quigley unsuccessful on at least three occasions. Five minutes before the break, an injury to Ruairi Harkin forced him to retire and he was replaced by David Scullion. In what was to prove the decisive move of the whole match, in the third minute of first-half injury time, Scullion picked up the ball from Paul Owens and coolly lifted it over the top of the advancing Rovers’ keeper Barry Murphy. Coleraine had taken the lead against the run of play. Scullion nearly managed to double his side’s lead ten minutes into the second half. 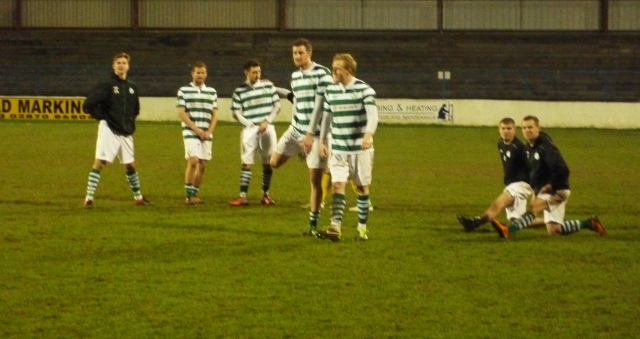 Quigley was replaced in the Hoops attack by Gary McCabe, who was involved in a few good moves along with Sean O’Connor. O’Connor came close with a free kick and McCabe likewise in the dying seconds of the game, when Coleraine had their goalie Michael Doherty to thank for keeping their advantage. A draw tonight for the Dons but if you are looking for a match report, look further down! I am going to reflect first of all on how my past was catching up with me today, taking in Dublin, Belfast and of course London, where the League Two match was played. I started the day in Dublin and as I began my journey northwards this afternoon, passed Milltown Park, where the Jesuit Provincialate is based. The complex used to be used for the training of Jesuit priests but now many of the buildings are leased. The Irish School of Ecumenics has its headquarters there. I was investigating the story of William Carleton, which I will be writing about on Saturday when we visit Sandford church. 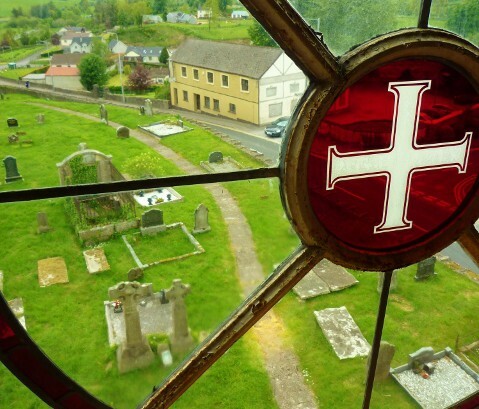 I was on the trail of a Fr John Carbery SJ, who was based at Milltown Park and was in touch with Carleton, a neighbour, before his death in 1869. I was given some helpful information about the Jesuit archives. 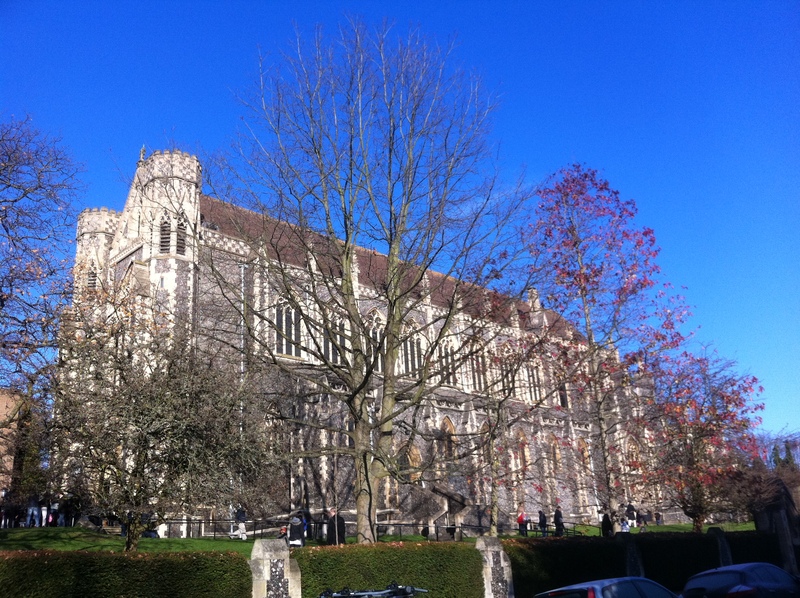 As I left the building I saw a rugby pitch which is now leased to nearby Gonzaga College, where I went to school for two years. In those days, the school rugby pitches were beside Glenmalure Park, home of Shamrock Rovers FC. 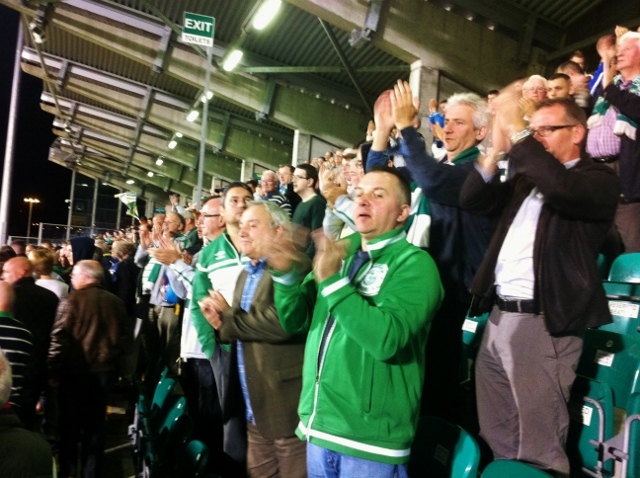 I have written about their history and revival at Tallaght here. In conversation with a Jesuit brother, I discussed how the order has decided to withdraw from the Sacred Heart parish in Wimbledon, where I grew up, owing to the shortage of priests. It was during my schooldays at Wimbledon College from 1963 that I started following Wimbledon FC at Plough Lane, then in their last season in the Isthmian League, having won the FA Amateur Cup thanks to Eddie Reynolds. The following season they entered the Southern League first division as semi-professionals. Tonight as I followed them live on Sky Sports, I was wearing a Wimbledon supporters’ badge dating to the 1974/75 season when they were Southern League champions. I went to (the) Chelsea to watch the match: my local bar on the Lisburn Road in Belfast. Another London connection! Anyway the televisions were showing some music channel but the bar staff kindly offered to turn over to Sky so that I could see the Dons in action, minus the commentary. I was delighted to see Jack Midson getting the opening score and then making it a double strike thanks to a penalty. His was one of the few recognisable names as the players came out of the tunnel before the kick-off. AFC Wimbledon were then unlucky I thought to concede a goal to Port Vale just before half time, making it 2-1. A lucky bounce on a well-struck drive eluded the keeper Neil Sullivan. 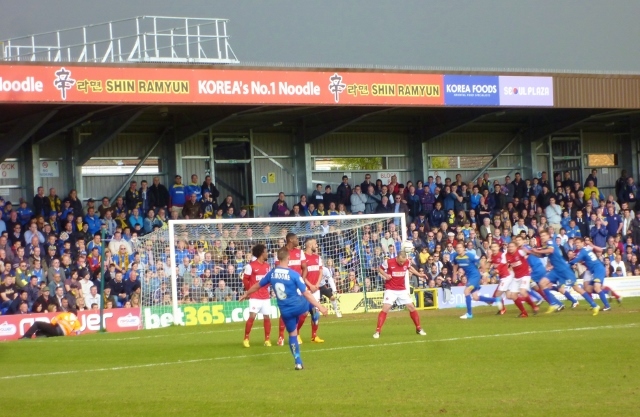 The second half saw some good chances for AFC Wimbledon including an effort by Midson that could have brought his hat-trick but was ruled offside. Then a bad back pass by Mat Mitchel-King and a mistake by Sullivan saw Port Vale equalising 2-2. The Dons held out against the league leaders and manager Neil Ardley will be pleased enough to come away with one point. But the Dons are still perilously close to the bottom place in the table and need to start winning a few games if they are to escape relegation back to the Conference. A full report on the match “Plucky Dons Deny Vale” can be found on the club ‘s website.